Bloom is an elegantly designed WordPress Theme with a calm green, grey & blue color scheme. 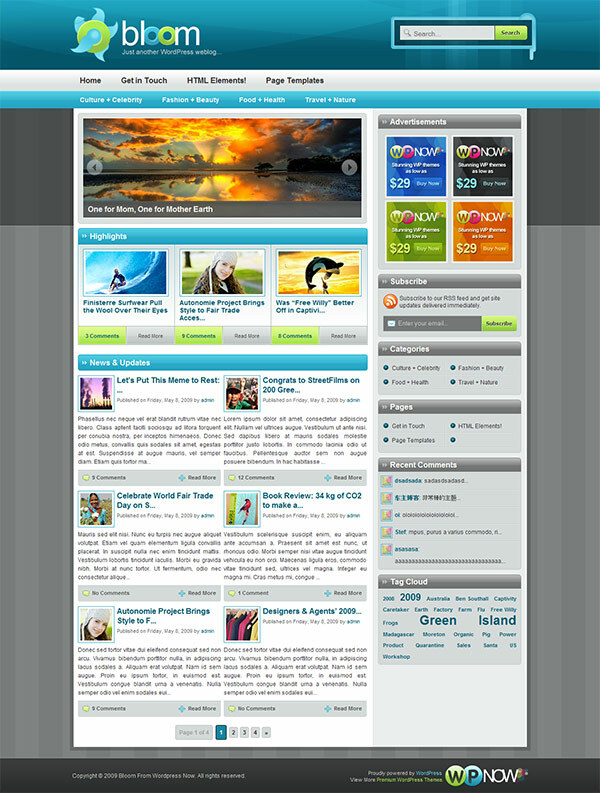 Widget ready, featuring All In One SEO and much more. The Bloom theme is WP 3.0 Ready, Supports 3.0’s Custom Menus, has an Intuitive Theme Options Panel as well as a Featured Content Slider, uses a Two-Column Layout and has 3 Homepage Featured Content Sections. The theme is Widget and Adsense-Ready, has an Easy-to-Use Pre-Defined Ad Locations, Custom “Subscribe to RSS” Widget, “No Sidebars” Template, “Links & Bookmark” Template, “Sitemap” Template and Five Level Dropdown Menus.